Perhaps some of you also were contacted by Revlon to test some of their products? 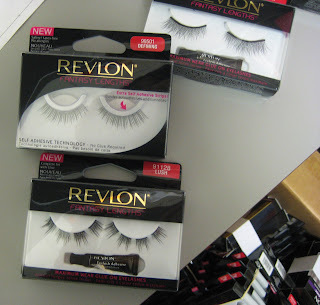 Well, as Revlon is carried in probably all of our pharmacies* on 34th Street, I asked for the lashes and fake nails. Honestly I was hoping to test some serious press-on nails. I can't resist the press-on. and these, decorative french manicures, YES! *Favorite 34th Street pharmacies: Irmat at 2 Park Avenue when I want highbrow, Walgreen's in the Empire State Building, just to be buying shampoo in the basement of the ESB, and Duane Reade on the corner of 34th & 5th, my go-to snack stop. **warning: none of these nails are actually press on, you've got to use the glue. But I do have several self-adhesive fake lashes. 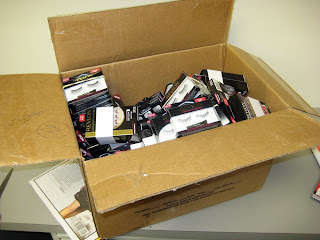 Sign me up for lashes! You know I love those. OOOH. 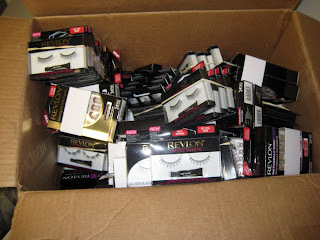 I've got my eye on some of those fake eyelashes! I love those. 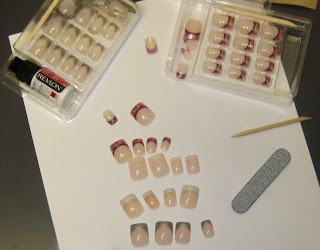 =) And press-on nails are really upping their game. I saw a pair with checkerboard tips that were awesome! WendyB & Farren - Check! I'm setting aside some pairs for you both. And Farren, I'm going to send you some particularly lovely checkerboard faux nails! Miss Yaya - send me an address if you'd like some! They are light, i can ship overseas. Gel-Nails - hmm, you're scaring me a little. So will we get pictures of you all glamed up too? Holy moly, they were generous! haha woah, I wish I can get a box of promos. Looking foreard to the pics! Natanya - reserving pairs for you! just takes a little practice and you'll be a pro. I'm not sure about those glamour shots, maybe i can photoshop a close-up! Miss Woo - I'm putting you on the advance reservation list too. Thank you sweetie, I'm a little scared I will put my eye out but all in the name of beauty, right!